Russian engraver of the twelfth century. In a collection of documents published by Professor Kunik of the Russian Academy of Sciences and relating to business transactions between the people of northwestern Russia and those of the city of Riga, there is a document, dated 1284, containing the decision in a suit, concerning a bell, between a Russian and a German. It bears the signature of Feodor, Duke of Smolensk, to which is added, "Moses, engraver of Feodor, made this seal." The document does not state that this Moses was a Jew, but it may be safely concluded that he was, for the name "Moses" was not in use among the Russian Christians of that time; as Kunik points out, the Russians knew nothing of the art of engraving seals and coins. 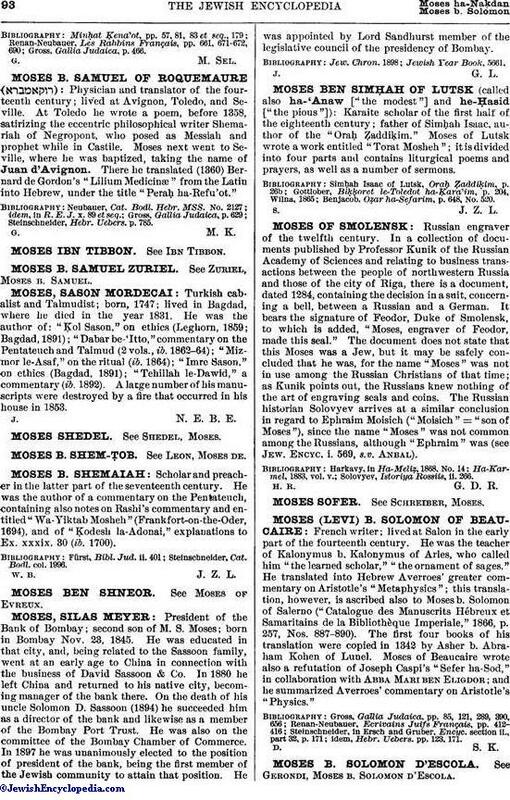 The Russian historian Solovyev arrives at a similar conclusion in regard to Ephraim Moisich ("Moisich" = "son of Moses"), since the name "Moses" was not common among the Russians, although "Ephraim" was (see Jew. Encyc. i. 569, s.v. Anbal). Solovyev, Istoriya Rossiis, ii. 266.